The KOBRA Compactor model C-500 is designed to work with the Cyclone industrial shredder when paper is being shredded. When shredding other materials, you simply remove the compactor and use standard Cyclone disposal bags. This optional accessory compresses and reduces the volume of the shredded paper by 4 to 5 times to minimize the space required for disposal. Easy to install and operate, the KOBRA Compactor C-500 and will work with any Cyclone security level screen. Compacted shredded paper can be collected into any type of container or into plastic waste bags. The collection bin is not included. 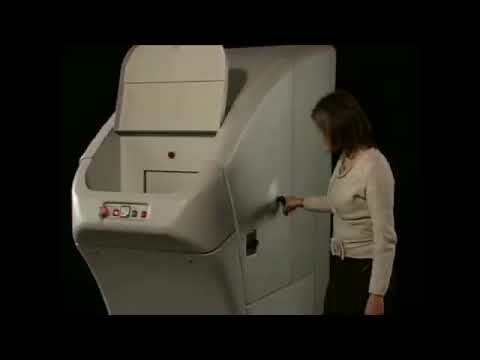 The KOBRA Cyclone is a truly unique Industrial shredder/disintegrator designed to destroy large quantities of material up to 420 kg per hour (depending on screen size): paper - 500 sheets at a time, credit cards - 45,000 per hour, CDs - 15,000 per hour, Floppy-Disks - 7,000 per hour + cardboard, carton boxes, aluminium cans and plastic bottles. The Particle size or Security Level (DIN 2 - DIN 6) can be chosen when purchased and can be interchanged at any time after installation of the unit with a simple operation to adapt to any shredding requirement. The shredding capacity of 500 sheets at a time remains unchanged with any Security Level installed in the machine. With theoretical output, there are a number of variants which may affect the actual capacity of the Cyclone including the speed of the operator, downtime to change collection bags and filters, the changing of screens, types of material shredded, age and condition of cutters, power supply and maintenance etc. so it is suggested that realistic capacities should be adjusted by -25% or more to the above theoretical outputs, and no guarantees of capacity are given. The Cyclone is equipped with an integrated vacuum system specifically designed to provide the operator with clean and dust free shredding environment. The KOBRA Cyclone is built with a double insulated shredding chamber and special plastic outer housing enclosure for low noise operation. It does not require any oiling of cutting knives or special maintenance. This makes it easy to use for everybody at the office. KOBRA Cyclone complies with the shredding standards of ASIO - Australian Security Intelligence Organisation - T4 Protective Security. Security Level 6 meets the NSA/CSS Specification 02-01 of National Security Agency. The KOBRA Compactor model C-500 (sold separately) is designed to work with the Cyclone industrial shredder when paper is being shredded. When shredding other materials, you simply remove the compactor and use standard Cyclone disposal bags. This optional accessory compresses and reduces the volume of the shredded paper by 4 to 5 times to minimize the space required for disposal. Easy to install and operate, the KOBRA Compactor C-500 and will work with any Cyclone security level screen. Compacted shredded paper can be collected into any type of container or into plastic waste bags. The collection bin is not included. ShreddingMachines.co.uk has been designated as an Official Supplier of the KOBRA Cyclone and offer Site Surveys, Installation, Full Operator Training, and Ongoing Service Support on these products, as recommended by the Manufacturers. All Specifications stated are to be used as guidance only and are subject to change at any time. Throughput Capacities are sometimes only achievable in ideal situations, and in some cases are Theoretical as conditions vary and are dependent on operator usage.